We offer a non-invasive alternative for the clearing of spider veins and reticular veins, with no incisions, minimal discomfort and no downtime. Our laser leg vein removal uses pulses of light at just the right wavelength to constrict the vessels responsive for leg veins, causing the vein to degenerate and visibility to disappear. GentleYAG leg vein removal uses laser technology, directing powerful yet gentle light-based energy directly into the skin. 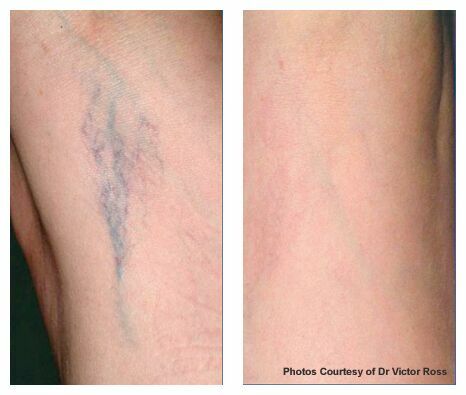 The laser targets the vein, causing the blood inside it to coagulate. Over time, the vein collapses and eventually disappears. It is important that the skin that is not tanned. No needles or incisions are used, but the heat from the laser can be quite painful – cooling helps reduce the pain. Laser treatment for one area can last up to 15 minutes.